We’ve all made them a thousand times, but do you really know how to make perfect scrambled eggs? 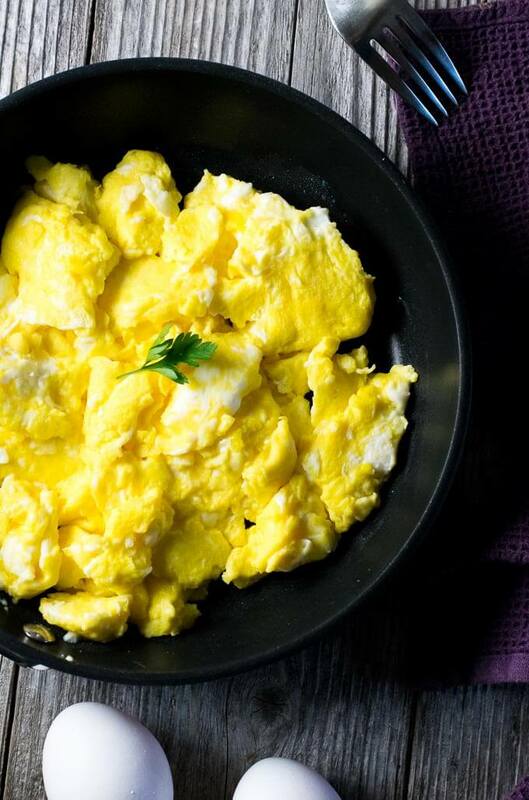 There are a few tricks to mastering perfectly light & fluffy scrambled eggs every time! Who doesn’t like scrambled eggs? They are embarrassingly easy to make, and they were likely the first thing you learned how to cook. However, any honest person will admit their version of scrambled eggs was rarely up to snuff with a good restaurant’s scrambled eggs. Have you ever stopped to wonder how restaurants get their scrambled eggs so light and fluffy? Admittedly, for years my scrambled eggs consisted of just dumping eggs in a skillet, cooking it till there were no signs of life and then eating my dense rubber curds of eggs with oblivious satisfaction. However, there is a better way. If you are going to make perfectly light and fluffy scrambled eggs, the first thing you need to do is get the pan right. Don’t waste your time with a stainless steel skillet. Half of your eggs will stick/burn to the bottom of the pan before you are finished. To have any chance of success you need a quality non-stick pan like my skillet from All-Clad. The surface is so slippery I don’t even need butter if I don’t want to use it, and I can simply wipe it out with a dry paper towel to clean it when I am done. It is the perfect slick surface for eggs to slip and slide on while they cook. Disclosure: I contacted All-Clad and requested to receive this skillet complimentary because I believe in their quality and felt their pans would be a benefit to the readers of FoxValleyFoodie.com. Any Amazon purchases made through affiliate links help support FoxValleyFoodie.com. Next, your eggs will be more tender if you mix them with a small amount of milk. The milk adds fluff and volume to the scrambled eggs. I recommend mixing it together in a separate dish prior to adding them to the hot pan. This allows the eggs to cook more evenly and fully incorporate the milk prior to cooking. This next tip is highly debated, however, I firmly believe you need to season the egg mixture with salt prior to cooking. Some chefs wait till the eggs are cooked before finishing them with a light dusting of salt. Their rationale is that salt extracts moisture from the egg and will create drier scrambled eggs. Personally, I think this is nonsense, as long as you stop cooking the eggs in time. Seasoning the mixture prior to cooking ensures every bite is properly seasoned. Cooking scrambled eggs on medium-low and folding continually will ensure more even cooking. Cooking on too high of heat will result in an overcooked, dry, scrambled eggs. Same if you don’t fold the eggs. 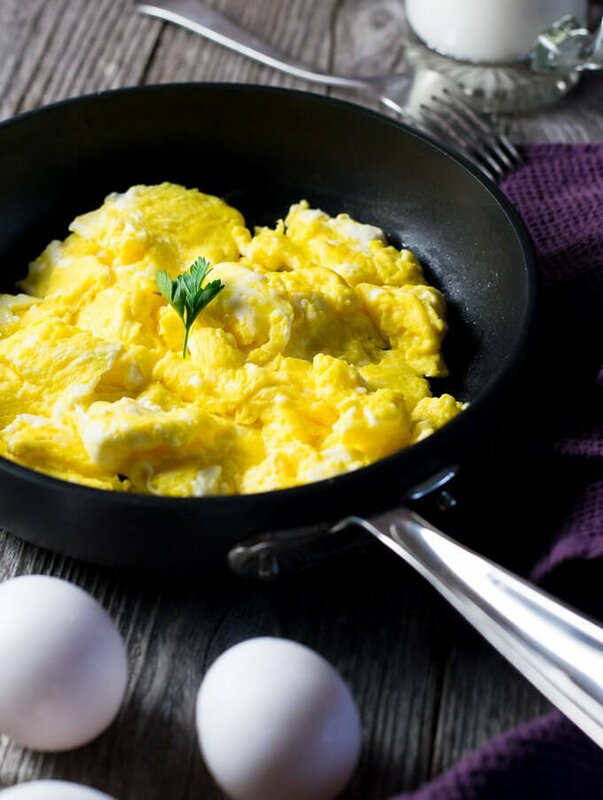 To properly fold the eggs use a spatula to stir and flip the egg mixture as it cooks to create large curds and help the runny portions hit the skillet surface. Finally, and possibly more important of all, stop cooking before the scrambled eggs have completely set. The eggs will continue to cook out of the skillet, so you actually want to remove them from the skillet just before they finish cooking. If you remove them only when they are done, they will dry out as they begin to overcook. We've all made them a thousand times, but do you really know how to make perfect scrambled eggs? 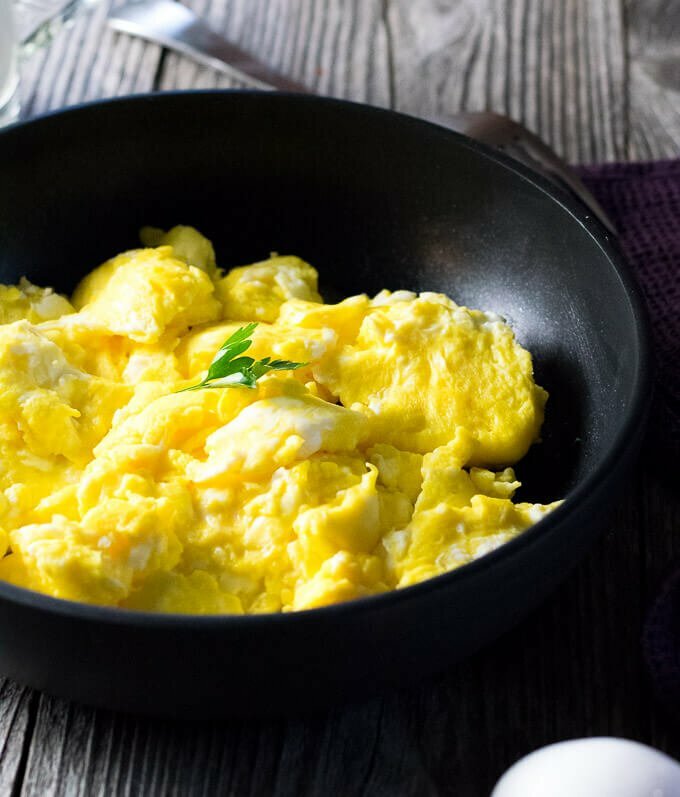 There are a few tricks to mastering perfectly light & fluffy scrambled eggs every time! Melt butter in a skillet over medium-low heat. While butter is melting add remaining ingredients in a bowl and whisk to combine. Pour egg mixture in the skillet and use a spatula to continually fold the eggs as they cook to ensure even cooking. Remove scrambled eggs from the skillet just before they finish cooking, they will continue to firm up outside the skillet. You can use less butter if desired, however butter adds great flavor to your eggs. IF YOU LIKED THIS RECIPE you will love my Homemade Hash Browns from Scratch. 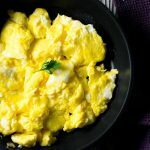 If you enjoyed reading How to Make Perfect Scrambled Eggs – Light & Fluffy then you should probably like me on Facebook and follow me on Pinterest too. That’s what I would do at least, because if you don’t get to know me but you still use my recipe it is kind of like taking candy from a stranger, and your mom taught you not to do that. Don’t disobey your mom, subscribe to Fox Valley Foodie today. This is the best way to make them! My family loves my scrambled eggs! I use bacon fat and butter.